PaulyPaul's review"Very simple and works well. You will eventually need more MIDI INS and OUTS"
The MIDI Sport Uno is a small plug and play MIDI device that is so simple to set up. You install the drivers then plug it in and you can use it right away. It does not require any power supply and it connects to your computer through USB. The problem that I had with it is that there was like a slight delay between sending out MIDI signals. Which really messed up my workflow a lot. I used it with my M-Audio MIDI controller when I was getting these issues. The price of the Sport Uno is 40 dollars, you really can not beat that price but how long are you going to use this MIDI device? Do you plan on having more gear (MIDI)? That is where I had to get rid of it , this was the first MIDI device that I actually purchased and used it for about two months, then sold it and bought one with more inputs, the MIDISPORT 2 by 2, then I ended up selling that to get one with 5 inputs. So I wouldn’t waste your time buying this unless you only plan on keeping 1 MIDI connection. It would be better to just invest in a device that has enough MIDI for your growing set up over time. But if you don’t plan on growing and getting more MIDI gear then the Sport Uno will work great for you. Setting it up was quick and using it is simple. Make sure if you are using it with a MAC that you have 10.1 OS or higher, anything lower than that it will not work. If you are on Windows you will need to download the proper driver especially if you are on a newer system like Windows 7 or even Vista 64 bit. This is a great MIDI device, but it will leave you needing to upgrade within a year. JeffTadashi's review"Simple MIDI Interface in Cable Form!" The M-Audio Midisport Uno is a usb 1x1 midi interface that is compacted into cable form, thus making it pretty easy to connect a single midi device to a computer without the need for any additional midi cables. It is over 6 feet in length and can reach to any devices that are located near a computer setup. It includes both midi out and midi in, although it can be confusing which connection is which, since you would have to connect the Midisport's midi in to the device's midi out, and connect the Midisport's midi out to the device's midi in. It always requires some trial and error to make sure the Midisport is plugged in correctly. 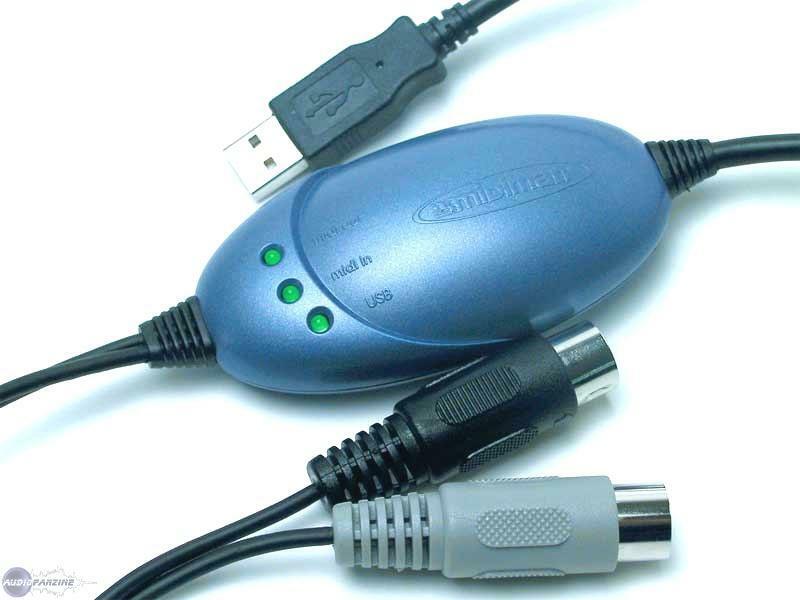 The M-Audio generally requires the drivers to be installed separately, and at least on my older Windows XP system, two sets of drivers were necessary: Midisport drivers, and Midisport loader drivers. When plugging the Midisport into the computer for the first, time, it must run through both hardware driver installations for both the loader and the actual device. This can be confusing, and hopefully M-Audio has updated this driver system for Windows 7. I have no experience using this particular interface on a Mac system. Like most midi interfaces, the Midisport works flawlessly, and I never noticed any signal lag or loss of signal or data. There are even LED's on the device that lets you know when the Midisport is powered, and when it is receiving midi in, and when it is sending midi out. Overall, this is a great, simple midi interface if you only plan on using it with a single midi device. Being in cable form has it's advantages, but it can also be awkward if, for example, the cable does not reach far enough, or if in a certain wiring, the central box floats awkwardly in the air. But overall, it is extremely portable and works as advertised. Perfect for laptop setups! tagj3r's review (This content has been automatically translated from French)" Nothing to say for the price"
Used to connect my PC keyboard controller noon, before a sound card that features a MIDI port. Since I have a sound card with midi I do not use any more, but I keep it as a fallback one day to buy a more expensive sound card, without having to take it with midi ports! Stable drivers (used in Windows XP 32bit). I have never updated, because I run on a dedicated PC to computer music. So when something works, I do not touch it! Never had a problem of saturation. The product does exactly what it is made. He does it well, no frills. In short, it is a choice that I will ever, especially for the quality / price. One in and one OUT. to control my hardware synth live or on audio device. The drivers are stable, no problems so far. I use it mainly with Pure Data. Not a problem of saturation of the Midi interface! I have not tried other interfaces before buying it, it does not have many competitors in CME and edirol I think. simple, plug and play, something I like animals but led that indicates the midi in and out is prtic , it would in a jacket pocket. The length of twelve o'clock in and out far too long ... but hey it's my personal opinion. I would do is choosing without hesitation! I was looking for something to drive my ToneLab SE AX100 and my future . With the Uno, I found what I needed for less. My config: Laptop a Tosh Satellite M70-204 (Centrino 1.73 GHz, 1 GB RAM) running XP SP2. A curious note: after install kit via CDROM, XP discovers the Uno and asked to install the driver! Which act and reboot. Launch Tonelab Sound Editor: interface immediately recognized and operational. No crash to mourn, the drivers seem quite stable (those of the CDROM, I have not yet updated). I use it for two weeks several hours a day (long live the holidays). What a joy to load the patches downloaded over the net and make its settings without being on all fours. In short, to advise people looking for a midi interface simple and inexpensive. Without hesitation, I would do this choice.